Wisteria is a showy climbing vine with clusters of scented dangling white to purple blooms. They provide impact to fences, trellises, walls and other areas where the thick woody vines can trail or scramble. Two main varieties are used: Chinese and Japanese. Both are fairly hardy vines but they are deciduous, and the lacy leaves turn color and defoliate in fall. A wisteria with yellow leaves may be due to this natural occurrence or there might be a pest, disease or cultural problem. Let’s investigate why do wisteria leaves turn yellow and find out what, if anything, to do about the issue. My Wisteria Leaves Turned Yellow, Why? A classic garden is almost incomplete without the lush vines and pendant blooms of a wisteria vine. The plant’s easy elegance and twining vines create a layer of texture and beauty that is unmatched by other vines. Wisteria leaf problems can stem from a number of conditions, but the plant is vigorous and relatively tolerant of minor conditions. My wisteria leaves turned yellow during October as a natural response to cold temperatures. If you find leaves on wisteria turning yellow out of season, then it’s time to do a soil test and look for pest activity. Average seasonal foliar displays aside, why do wisteria leaves turn yellow in the growing season? One of the main reasons may be an iron deficiency in the soil. An easy to find soil kit can give you the answer. If iron is deficient, roots have trouble taking up nutrients. 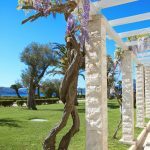 Wisteria enjoy neutral to slightly acidic soil. The lack of iron in soil will create a soil pH that is too alkaline. This is easy to amend with the addition of compost or peat. Another possible issue is poor drainage. Overly boggy, soggy soil is not a condition that a wisteria will put up with and that excess moisture will manifest in limp, yellowing leaves that will start to fall off the plant. Check your drainage and stop watering until you can maintain proper porosity. 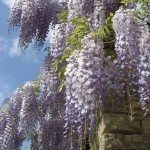 Wisteria are tolerant plants with few pest or disease issues. That said, wisteria can become prone to viruses and fungal diseases. Tobacco mosaic virus is a common disease of ornamental plants. Aphids and other sucking insects transfer the disease and there is no cure. The leaves become streaked and mottled with yellow and may fall off. 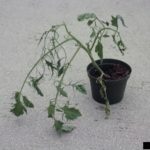 If the plant is healthy, the foliar disintegration will probably not kill it, but rampantly infected plants should be removed. Good cultural practices can help a stressed plant and improve its chances of survival. Fungal diseases are the bane of many a gardener. Warm, wet regions are especially prone to fungal issues. Keep leaves dry by watering from under the plant with a soaker hose or drip system. Fungicides may have some effectiveness if applied at the beginning of the season, but if you wait until a wisteria with yellow leaves has been too badly affected, they are not terribly useful. Catch any issues early and baby the vine to enhance its endurance and vigor. It takes some pretty serious infestations to bother a wisteria. Scale and aphids are sucking insects whose feeding behavior can cause faded, yellowing leaves and loss of plant health. In small numbers, they pose no serious threat to the plant but young plants or plants that are stressed may have reduced health. Scales look like tiny bumps on stems and vines. Aphids are small flying insects which can be identified by the presence of honeydew, a sticky substance that is the insect’s waste. Honeydew creates a clear, sticky coating on leaves. Aphids can be rinsed off leaves or either pest can be controlled with insecticidal soap or neem oil.